As many commentators have pointed out, the yield curve has developed a sort of humped form in recent months. That has led many to speculate about when the yield curve will invert, foreshadowing a recession. If, as the logic goes, the yield curve is about to invert then we all better take cover. After all, the yield curve is a big driver of banks’ incentive to make loans since they borrow money at short-term rates and lend money out at longer-term rates plus a spread. If banks have no incentive to make loans because the marginal profitability of new loans is so poor (i.e. the spread between short-term borrowing and long-term lending is not great enough or even negative), then credit contracts and a downward economic spiral is kicked off. Unfortunately, the the humped nature of the yield curve itself provides more noise than signal, as forward returns when the yield curve has been humped have been both extremely good and extremely poor. Therefore, must look deeper to gain more clarity as to what the signal is from today’s yield curve shape. 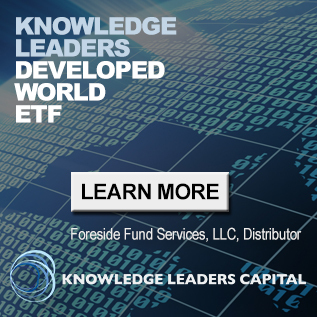 As readers know, the yield curve is typically upward sloping, with longer-term yields higher than shorter-term yields at every point along the curve. The first chart below shows the average yield at each maturity for US Treasury bond market since 1986. 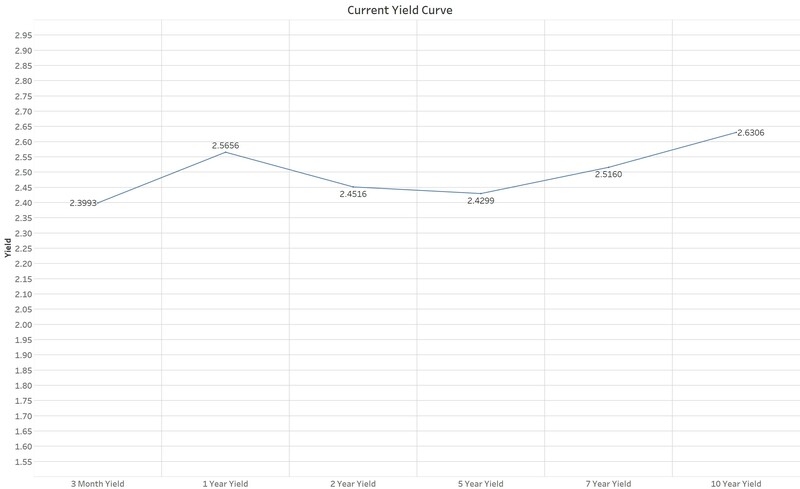 In contrast to that nice upward sloping curve, the current yield curve looks like the next chart. Currently, 1 year yields are higher than 2, 5, and 7 year yields. The current yield curve is neither upward sloping nor downward sloping (aka inverted), it’s humped. 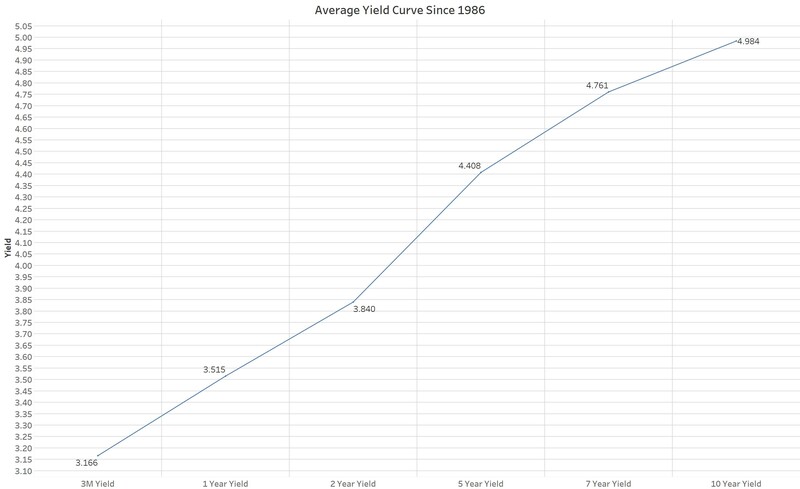 A humped yield curve is only a somewhat rare occurrence. 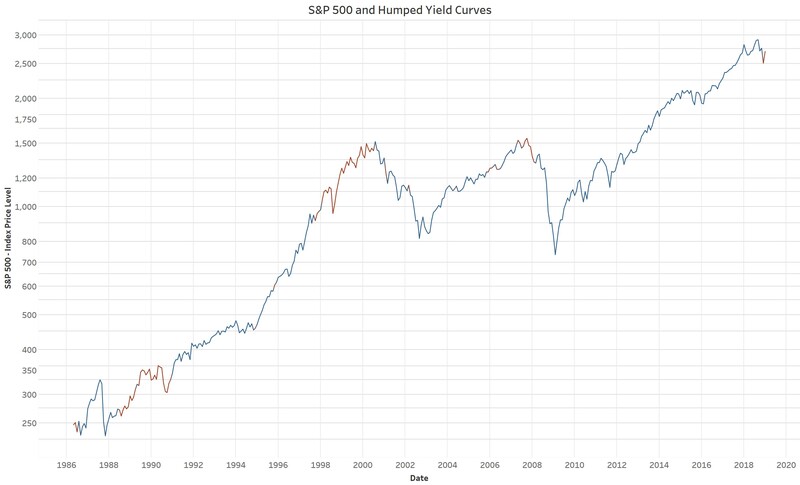 Since 1986 the yield curve has had some measure of humpedness 25% of the time. 100% of the time (since 1986 at least) after the yield curve took on a humped shape, stocks eventually fell quite a lot, but with a variable lead time. For example, the yield curve became humped in May of 1986, 15 months before the market peaked in 1987. It became humped in July 1988, 24 months before the market peaked in July 1990. The yield curve took on a humped shape again in October 1997, about 2.5 years before the tech bubble imploded. However, the lead time before the 2008 crash was much less, as it became humped only five months before the top in stocks. Even in the last cycle there were false signals as early as late 2005, in which the yield became slightly humped, but no major damage was done to stocks. 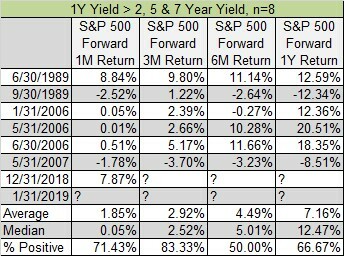 The next table below summarizes the forward returns for the S&P 500 when the yield curve is not completely upward sloping or completely downward sloping at each maturity (i.e. when it’s been humped). 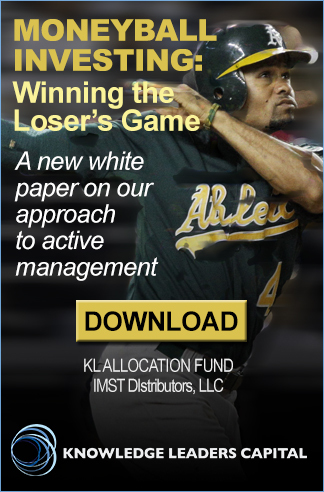 The median year-ahead return is about average with a 62% positive hit rate. Not bad, but the best return was +38% and the worst was -45%. That’s too much dispersion to draw any solid conclusions since one wouldn’t want to go headstrong into stocks in front of a -45% year. The next two charts help illustrate this point. 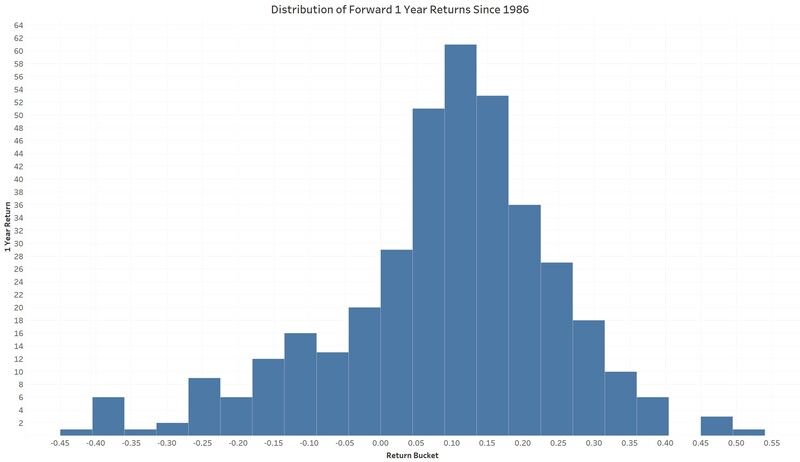 First, we show a histogram of forward 1-year returns for the S&P 500. The chart has a nice bell shape appearance, though with noticeably more negative outliers than positive ones, which is common with financial series like stock prices. The second chart shows a histogram just for periods when the yield curve displayed some degree of humpedness. 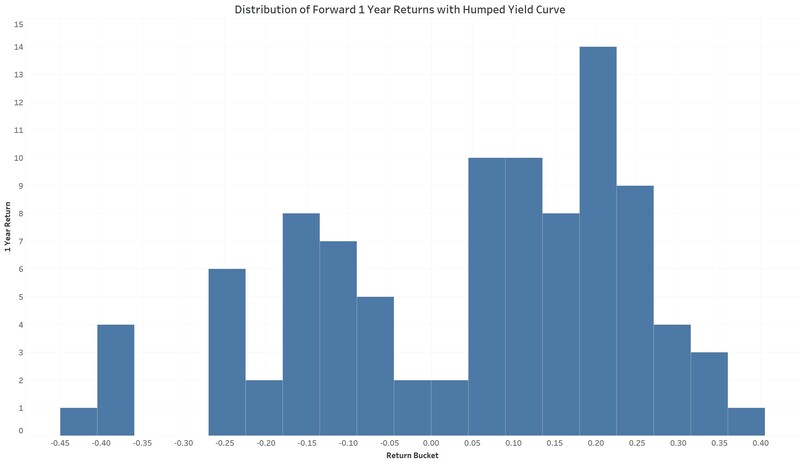 Here we see the true nature of what a humped yield curved portends for the broad stock market: forward returns are either extremely good or extremely poor, though they do skew positively. Since just observing a humped yield curve does very little for us, in the next section we analyze periods in which the yield curve is inverted at least from the the 1 year maturity to the 7 year maturity. The interesting thing about the shape of the yield curve today (i.e. being inverted from the 1Y to 7Y maturity, but not either inverted fully or from 1Y-10Y) is that it only happened one other time: May 2006. In that case, the yield curve went on to fully invert in July 2006. Because of the small sample size, we include periods when the yield curve was either inverted from the 1-7 year maturities or from the 1-10 year maturities. Even here there are only eight monthly observations since by the time the curve is inverted from 1-7 years it’s usually fully inverted from 3 months to 10 years. When we look at these eight example we observe a positive bias to forward returns, but note that returns are either again much better than normal or much worse than normal. However, a close look reveals that this condition of the yield curve being mostly inverted happened in only two distinct time periods: the end of 1989 and 2006. Both of those time periods were coincident to complete yield curve inversion and a subsequent bear market in stocks/recession. All said, the yield curve indicator is an imprecise predictor of stock price peaks. That said, the fact that the yield curve is currently inverted from 1-7 years tells us that full inversion is a high probability in the not too distant future. As readers know, when the yield curve fully inverts, the clock marking the end of the cycle starts ticking. Of course, unless this time is different.